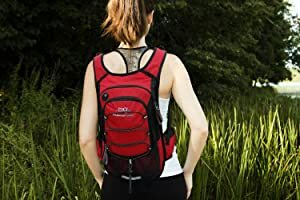 Outdoor Hiking Camping Rucksack Waterproof Polyester Travel Hiking Backpacks. Need To Have Enough Water On Your Outdoor Sports? Are You Wish Your Drink Could be Still Cool After Lots of Activities? Now you can have all these come true with owning Mubasel Gear Insulated Hydration pack. 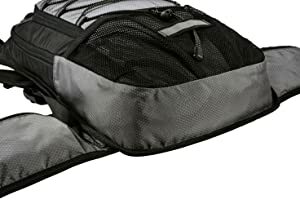 Amazing Insulated Bladder Compartment: No more hot waters in the summer, it's insulated! Adjustable Waist Straps: Put the backpack to work, and comfortably adjust the waist strap to bear the load! Useful Elastic Straps: Easily stuff your cloths, towels or other things. With the ventilated mesh padding shoulder straps and backside, you won't feel tired or hot during your daily wearing. Great workmanship on the good quality material, this pack is the one that can last whenever you want. Our bladder is made by FDA approved and BPA free material, test report will be sent to your e-mail after ordering. You can be totally rest assured to drink water from it. 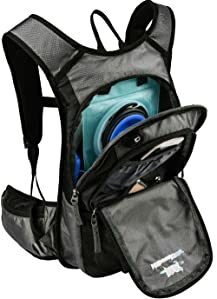 Mubasel Gear hydration backpack fits women, men, also girls and boys, now, this summer, get each one for your family, friend. The best gift that keep the people you care for hydrated all the time. 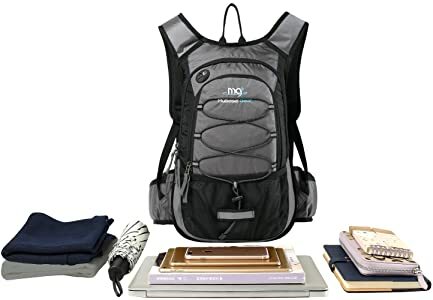 Nice backpack with a lot of space. Didn't test if waterproof or not. Bet more than a month. Track tracked. The seams are stitched well, the accessories are normal, all the locks work. The colors are bright, as in the picture. The backpack is roomy. Smort well! I recommend. The product looks good, it seems to be qualitative, zippers work good and they are pretty strong. For the price I paid the product is a good deal. Delivery in 16 days. Shipping in 10 days, quality/price according.